This specialist degree programme will give you the knowledge of biology and disease, and the engineering and problem solving skills to contribute to areas such as designing artificial and regenerative tissues, robotic surgeries and improved prosthetics. Mathematics, Biology at grade AA and either Physics or Chemistry at grade B required. A total of 17 points in three higher level subjects, including a score of 6 in both Mathematics and Biology and either Physics or Chemistry with a minimum score of 5. D3,D3,M1 in three Cambridge Pre-U Principal Subjects, including Mathematics and Biology at D3 and either Physics or Chemistry at M1. A,A,B at Advanced Highers (or A,A at Advanced Higher and B,B,B at Higher), including Mathematics and Biology at A,A Advanced Higher and either Physics or Chemistry at Advanced Higher or Higher. Successful completion of the WBQ Advanced Skills Challenge Certificate plus 2 GCE A-Levels at grades AAB including Mathematics and Biology at grade AA and either Physics or Chemistry at grade B. You will benefit from teaching underpinned by world-leading research activity in medical devices from across UCL. Graduates will be capable of delivering world-class biomedical engineering solutions that sustain human health and longevity. You will engage with scientists, clinicians and engineers across UCL's Bloomsbury, Royal Free and Stanmore campuses. This close interaction with national hospitals means that education is driven by medical challenges. You will develop your entrepreneurial skills and learn how research can be translated into clinical practice. You will also learn about commercialisation within the medical technology industry. This degree comprises eight compulsory modules in both years one and two, which are split equally between engineering and medical science. In year three, you will have two compulsory modules including a Research Project and a choice of optional modules to personalise your education. 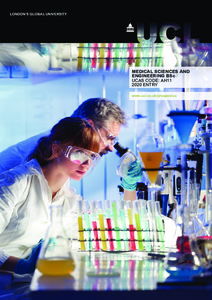 You will be encouraged to design your degree programme along themes which include engineering and medical sciences. You will have the opportunity to experience UCL's cutting-edge research laboratories, as well as state-of-the-art hospital facilities and will develop skills in information evaluation, integration, and its application to healthcare. A variety of optional modules will be available, allowing students to personalise their degree along a theme including engineering or medical sciences. Taught modules will be supported by specially-tailored, lab-based group tutorials. Working in small teams, students will apply their knowledge within a supported environment, supervised by academics. Formal learning will include practical classes, case-based discussions, workshops and research projects (group and individual). A range of methods of assessment will be used across the programme, including: written coursework, project reports, and unseen examinations (designed to test knowledge and understanding of both medical sciences and engineering). Detailed course descriptions are available on the department website: Medical Sciences and Engineering BSc. Graduates will be equipped to deliver world-class biomedical engineering and regenerative medicine solutions in clinical, commercial, regulatory and research environments. They will have the skills to move into the expanding global medical technologies and regenerative medicine sectors as product specialists, researchers, designers and regulatory advisors. Graduates may also enter NHS Clinical Scientist and Clinical Engineer training programmes. Recent government and industry reports have identified skills shortages in the healthcare and pharmaceutical sectors. These shortages need to be met by multidisciplinary graduates who can think broadly to create new solutions to global challenges. Graduates will be able to work in areas such as designing artificial and regenerative body organs and tissues, keyhole and robotic surgery, innovating techniques for diagnosis and treatment of disease, quantifying physiological function, designing equipment for improved surgical techniques, prosthetic reconstruction and assistive technology, and treating patients needing corrective treatments due to malformation, disease, cancer or trauma. We will be looking for evidence of your motivation, commitment and enthusiasm to pursue this degree. This could be demonstrated through relevant work or other experiences (e.g. attendance at a scientific exhibition). This programme will suit students who want to make a difference in the world, who are innovative and inventive, and who are prepared to be challenged. Due to the programme content, we require applicants have an A level in Biology and Mathematics, plus one additional STEM subject (e.g. Chemistry, Physics, Further Mathematics). We are happy to defer your entry for one year, provided that you have made definite plans for that year (such as working in a relevant field to gain experience or broadening your horizons through travel). We enthusiastically welcome students applying from overseas.